The Americans with Disabilities Act (ADA) does the important job of providing equal access, opportunities, and jobs to our nation’s disabled citizens. While it is imperative that the disabled have these protections, unscrupulous attorneys have found a way to turn the law into a money making tool. ADA cases have mushroomed in California, Florida, and New York over the past decade, and as Charles Toutant’s recent article in the New Jersey Law Journal, “Fla. Lawyers Driving Boom in N.J. Disabled-Access Suits,” reveals, New Jersey is the latest target. To attorneys who use the ADA and disabled plaintiffs as pawns in a get rich quick scheme, litigation has become the goal rather than the means to a greater end. Serial ADA suits are just the latest example of the growing problem of regulation via litigation. As a means of regulating the state’s businesses, the courts are not only a blunt instrument, they are also an extraordinarily unpredictable and expensive instrument. Nevertheless, in New Jersey, litigation has come to operate as the enforcement mechanism for a number of substantive laws. This has grave consequences as we continue to struggle to grow our way out of the recession. Increased litigation is inversely related to economic growth. A state’s litigation climate is one of the top factors business leaders consider when deciding where to locate their business or whether to expand. States with predictable legal systems that discourage abuse allow businesses to more accurately project what future legal expenses will be, allowing them to free up capital for business expansion and job creation. According to the latest U.S. Tort Liability Index from Pacific Research Institute, New Jersey has the most costly civil liability system in the country. An onslaught of abusive ADA lawsuits will only serve to worsen our situation. 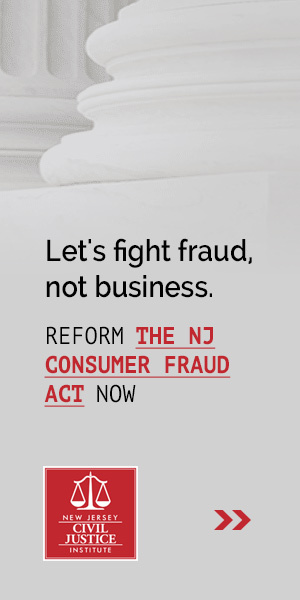 The NJ Civil Justice Institute is calling on legislators to give small businesses 60 days to comply with an ADA complaint before a lawsuit can be filed. “The goal of the ADA is to provide access to people with disabilities, not profits for trial lawyers,” said Rayner.